The “Living with Pancreatic Cancer: Patient And Caregiver Experiences Study (PACES),” conducted by Annette Stanton, PhD investigates the physical and psychological factors that contribute to overall wellness. PACES continues Dr. Stanton’s esteemed career of working to improve the holistic health of patients & caregivers over the course of their cancer journey. When diagnosed with pancreatic cancer, patients and their loved ones often do not know what to expect. It is important for patients, their family members and their medical teams to understand the ways in which this disease will affect them physically, psychologically, and socially. Understanding the far-reaching impact of this disease allows for the development of useful strategies for coping through treatment and beyond. This study is focused on promoting quality of life and health for those living with pancreatic cancer and their loved ones. PACES is made possible by Seed Grant funding and the Hirshberg Foundation’s commitment to researching all aspects of pancreatic cancer in order to improve the lives of those impacted by this disease. 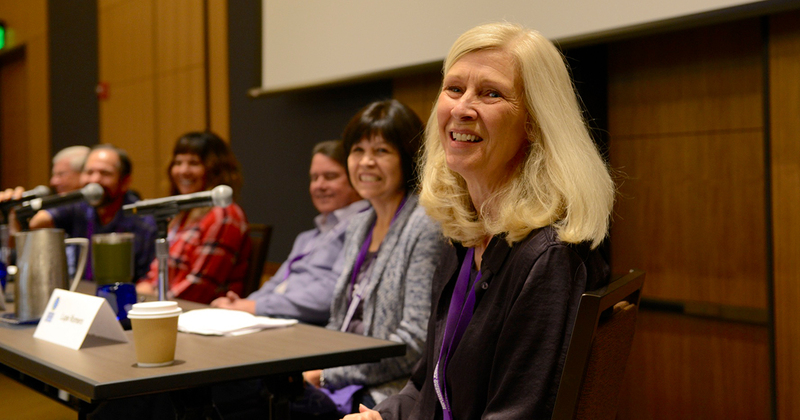 Dr. Stanton addressed the importance of managing the emotional journey, for both pancreatic cancer patients and their caregivers at the 2018 Symposium.